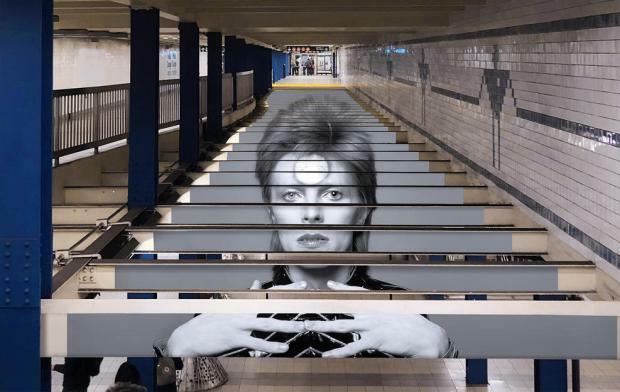 The subway went from soggy to Ziggy Stardust-studded, in just a matter of days. Every day, 5.6 million people ride the subway; more people than the entire population of New Zealand. When you mix that many bodies, some wild weather and a couple of tricky elevators -- and then sprinkle a little bit of Ziggy Stardust-- you might just get what we saw in the New York City subway this week. From a waterfall coming down inside a station to lines around the corner for David Bowie MetroCards, we've rounded up our top 4 moments from the New York subway from Apr.. 13 to Apr. 19. The panicked wail heard around the subway station could easily have been the rallying cry of so many New Yorkers taking the subway on any given day: "I'M GONNA BE LAAAAATE!" 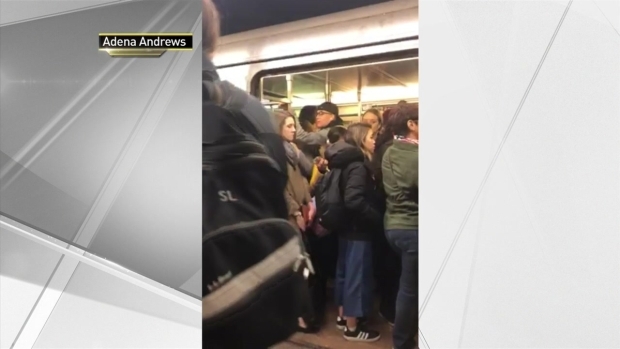 Sports writer Adena Andrews captured the commuter's startling scream while stuck at the Nostrand Avenue C train platform in Brooklyn last Thursday morning, and by Friday the extremely relatable video was making the rounds on social media. Turns out the hysterical rider had an internship she had to get to, but she was held up by a police investigation delaying traffic on the A and C lines. Other riders appeared momentarily startled, while one bystander on the platform is heard muttering, "This woman needs to chill"
On Monday, the tri-state awoke to a punishing rainstorm that saw dozens trapped in submerged cars in New Jersey and many more terrorized by gushing water in subway stations across Manhattan. A sheet of water was seen raining down in front of the open doors of a train inside the Bryant Park Station, while one man was captured battling upstream to exit the No. 1 train station at 145th Street and Broadway. 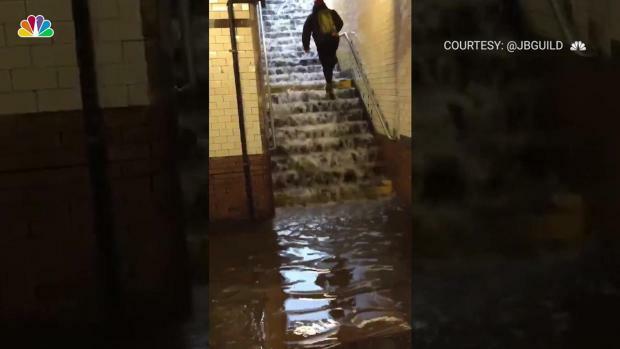 That station looked more like a scene from Atlantis than a city subway city station due to the flooding. Watch the incredible video above. All he wanted to do was get his beers up the escalator on a trolley. It wasn't as easy as it seemed. Another day, another commuter catapulted to fame through Instagram. 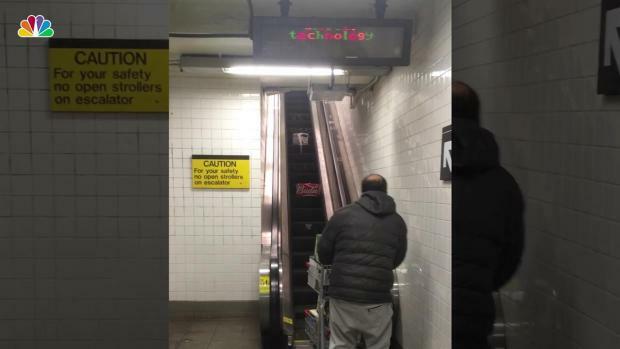 Video of a man trying to get his shopping cart full of beer onto the subway escalator at the Essex Street station was posted to the popular Subway Creatures account, where it garnered hundreds of thousands of views and more than 1,500 comments. Filmmaker Bingham Bryant captured the man's struggle: with his cart loaded to the brim with cases of Budweiser and Heineken, the man tries to push it onto the escalator steps. But physics is against him, and the beers end up falling off and riding the escalator to the top by themselves. Hundreds of New Yorkers crowded a Manhattan subway station for a chance to get limited edition David Bowie inspired MetroCards. On Wednesday night, hundreds of New Yorkers crowded the Broadway-Lafayette/Bleecker Street subway station for a chance to get limited edition David Bowie-inspired MetroCard. Commuters waited in lines that wrapped around the entrance to the station and continued up onto the sidewalk outside for their chance to get one of the 250,000 cards. The MetroCards, called a “Tickets to Mars,” display one of five Bowie personas including Ziggy Stardust, Aladdin Sane, and Thin White Duke. 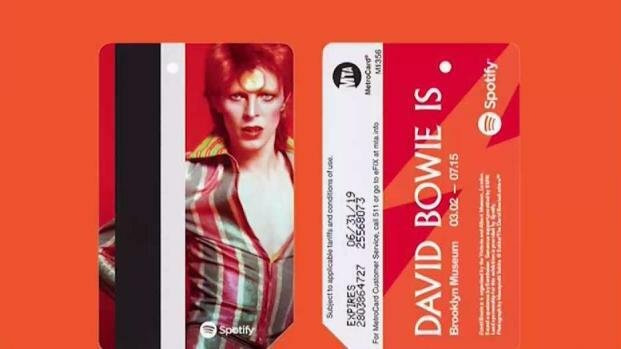 The MetroCards are part of an immersive David Bowie exhibition that has taken over the Broadway-Lafayette subway station until May 13. After a bag broke at the top of an escalator at the Jay Street-MetroTech subway station, spilled plastic bottles and bags almost caused a human pile-up Friday. Commuters were seen stumbling as they got off the escalator into the bottles, with one woman yelling at the people behind her, "Don't push!" 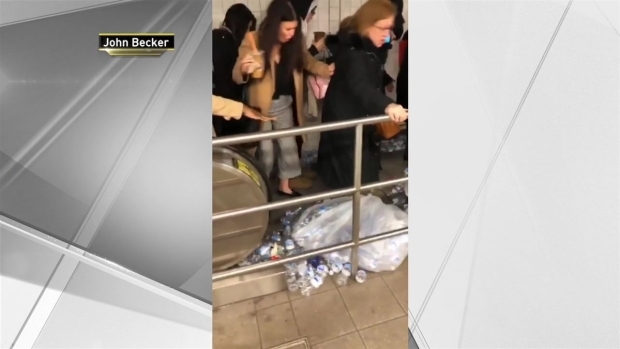 Bags of plastic bottles suddenly split open on the escalator at Jay Street-MetroTech station in Brooklyn Friday morning, nearly causing a human pile-up. Video by John Becker. Ravioli Guacamole is a golden doodle who seems to love riding the city's subway system. And she doesn't take up too much room -- she's quite happy sitting on her owner's lap. If you'd like your subway-savvy dog to be featured, just follow and tag us on Instagram, @nbcnewyork.